It is no secret that U.S. Sen. Kamala Harris has her eye on a run for the Presidency in 2020. Yet Larry Wallace, a senior staffer for Sen. Kamala Harris (D-CA) reportedly resigned on Wednesday over the discovery he was involved in a sexual harassment lawsuit and $400,000 payout to the victim while working for then California Attorney General Kamala Harris. And Kamala Harris claims to know nothing of this. Sen. Harris’s spokeswoman claims Harris has no knowledge of allegations of sexual harassment against her top aid – a guy she has worked with since the mid 2000’s. Despite her leadership roles, Harris has a long history of knowing nothing and blaming others. Anybody who comes forward at this point to be prepared to testify in the United States Senate against someone who’s being nominated to one of the most powerful positions in the United States government, that takes an extraordinary amount of courage. Harris was on CBS This Morning’ in September discussing 40-year old charges against Supreme Court nominee Brett Kavanaugh by Christine Blasey Ford, the woman who claimed Kavanaugh sexually assaulted her in high school. Sen, Kamala Harris also called for Democrat Sen. Al Franken’s resignation after he was accused of sexual misconduct by several women, and “introduced a bill in June to ban forced nondisclosure agreements in harassment settlements,” Breitbart reported. Let’s step back a moment to Sen. Harris’ aid Larry Wallace, his work history, and the sexual harassment allegations. Kamala Harris hired Wallace in 2011 when she was elected California Attorney General. Prior to this, Larry Wallace also served as the deputy chief of the bureau of investigations for the San Francisco district attorney’s office, under then District Attorney Kamala Harris. “He began his law enforcement career in 1987 with the Berkeley Police Department, where he was named Officer of the Year and awarded the Medal of Valor,” the LA Sentinel reported in 2011. “Wallace also worked for 10 years as a special agent with the San Francisco Bureau of Narcotic Enforcement,” also with Harris, who was San Francisco DA 2004-2011. Harris served as a deputy district attorney in Alameda County, Oakland, California, from 1990 to 1998. Back in 2006, Capt. Larry Wallace was the head of the witness relocation and support program in San Francisco, run by the district attorney’s office, when the second witness in two years was slain after leaving witness protection, according to an article in the San Francisco Chronicle. 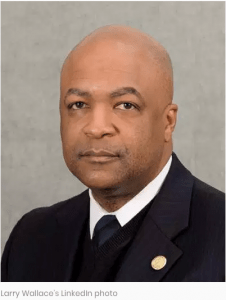 It is evident that Kamala Harris and Larry Wallace have closely intertwined careers, with Wallace working for or in the same department for Harris for many years, most recently with Wallace working as a senior advisor in Sen. Kamala Harris’ Sacramento office. As I explained in my book, California’s War Against Donald Trump: Who Wins? Who Loses?, As San Francisco’s elected district attorney, Kamala Harris was widely criticized by law enforcement for being soft on violent crime and homicides, both of which dramatically increased in San Francisco during her tenure, whereas crime fell statewide, according to Department of Justice statistics. Harris was frequently described as politically ambitious and cautious, and was criticized for doing nothing to take on political corruption. And that’s what we are seeing here with her denial of knowing anything about the sexual harassment charges and $400,000 payout to Larry Wallace’s victim. The Fresno Bee has a lengthy article about the lawsuit, with descriptions of Wallace’s harassment.